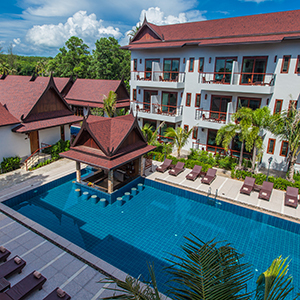 We are located in the peace and tranquil of 6 verdant rai which features 75 bedrooms, individually designed and decorated to combine comfort and convenience with refinement. 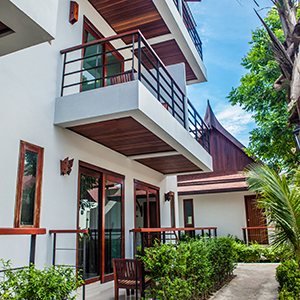 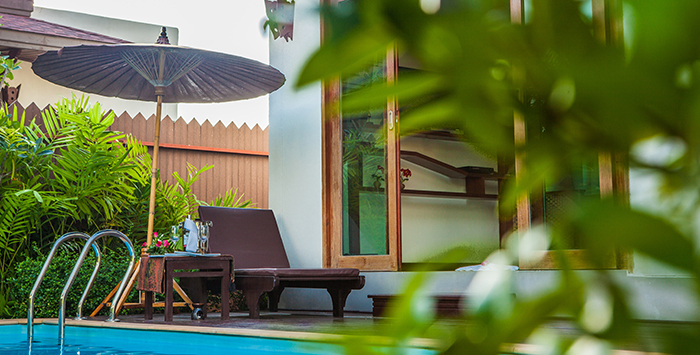 Each villa has its own balcony that provides a sanctuary for private sunbathing and complete relaxation. 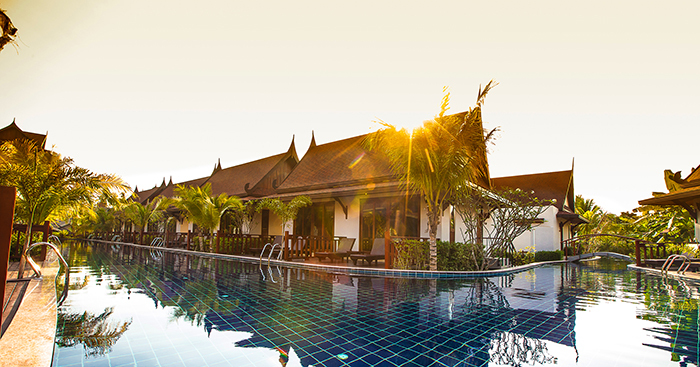 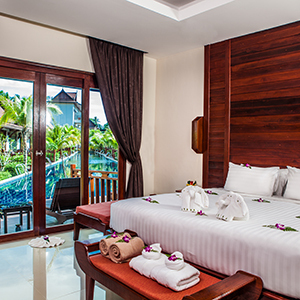 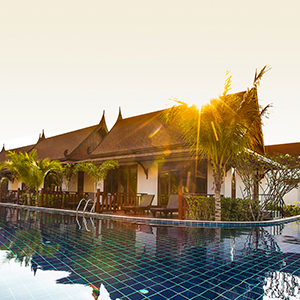 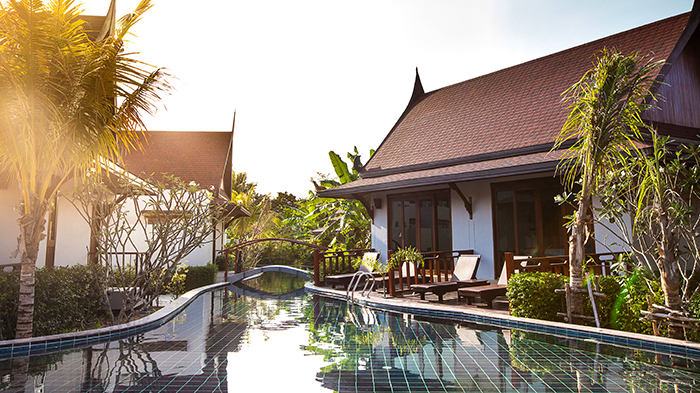 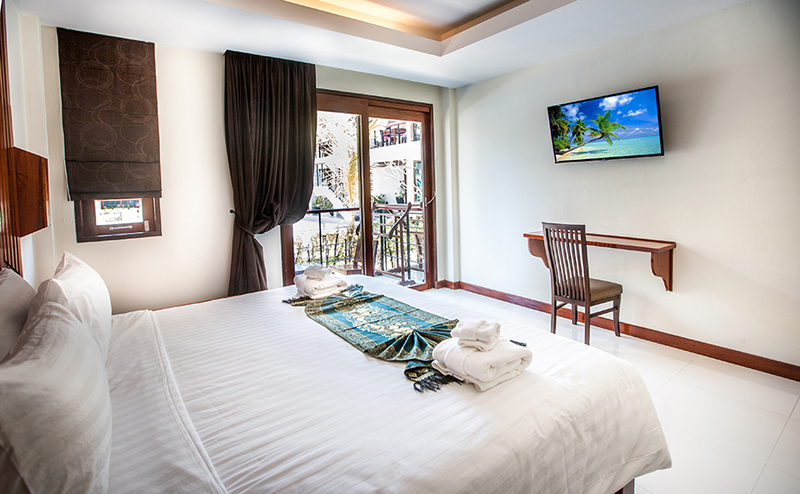 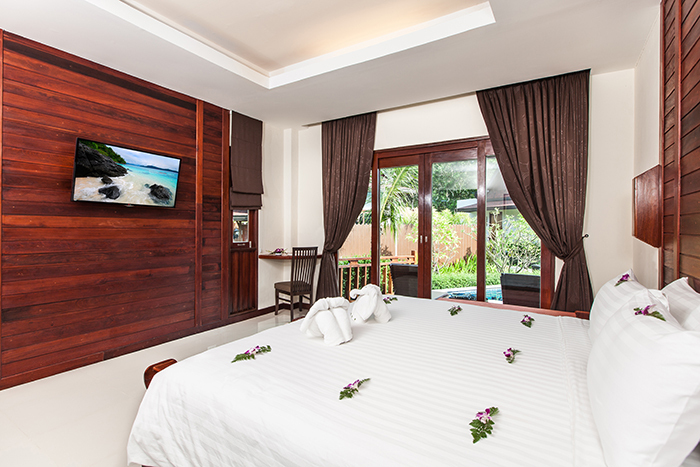 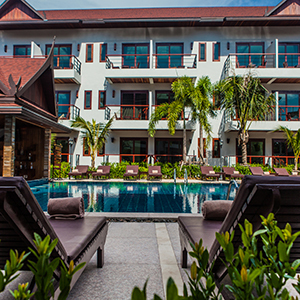 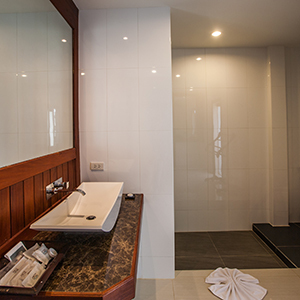 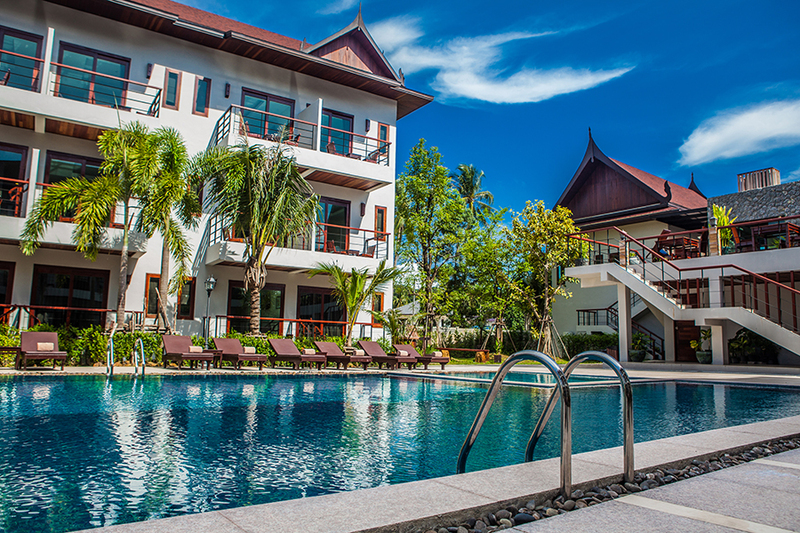 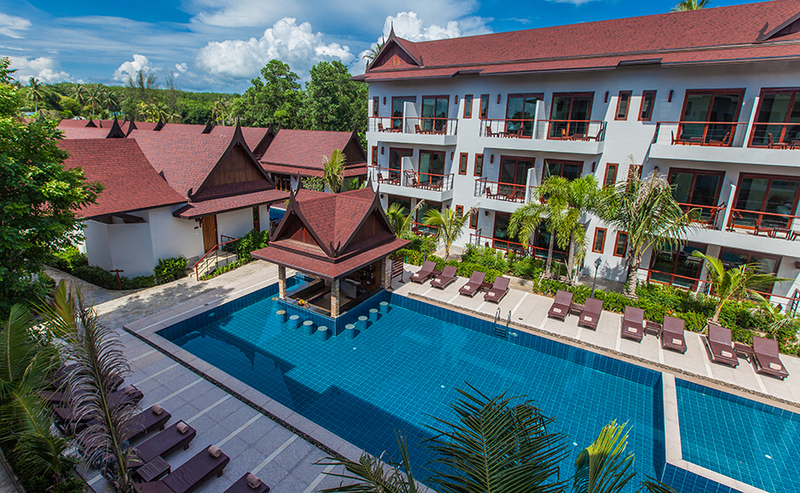 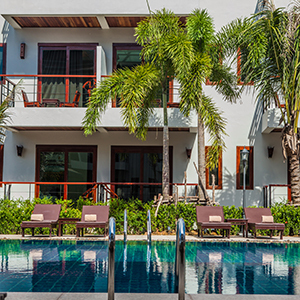 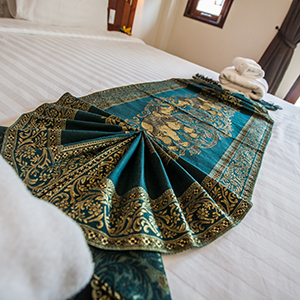 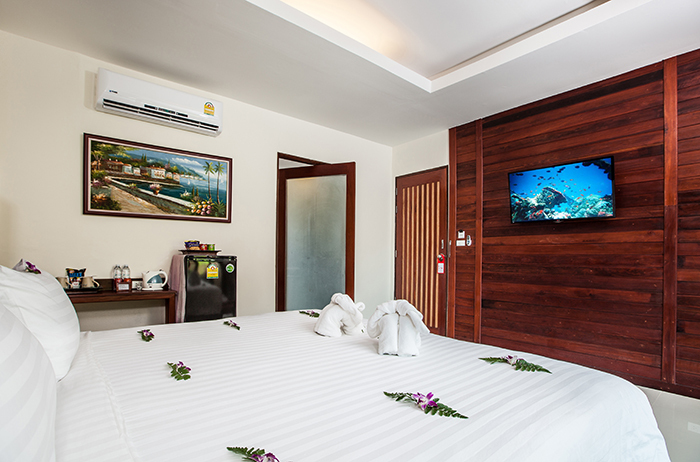 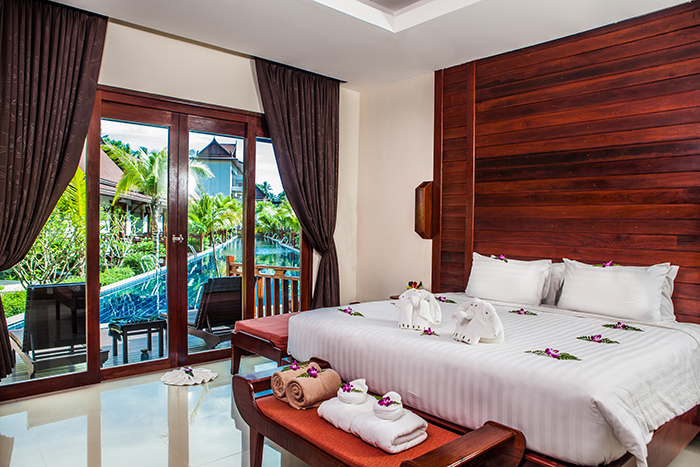 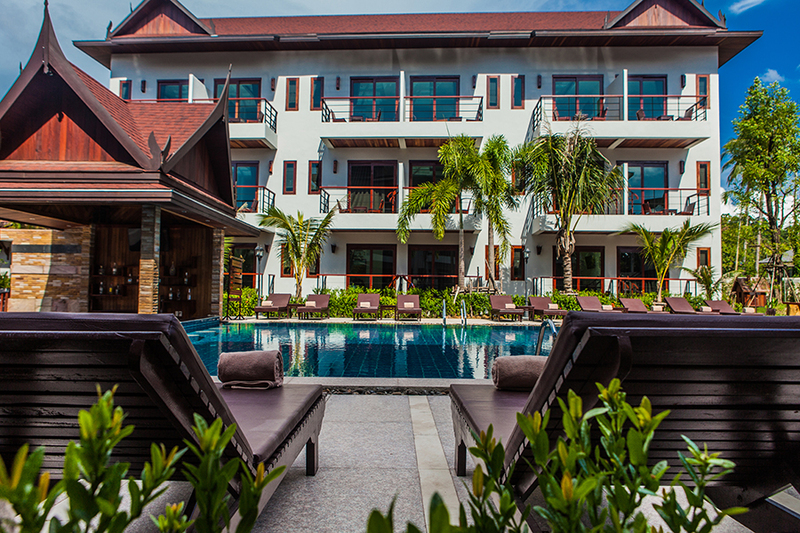 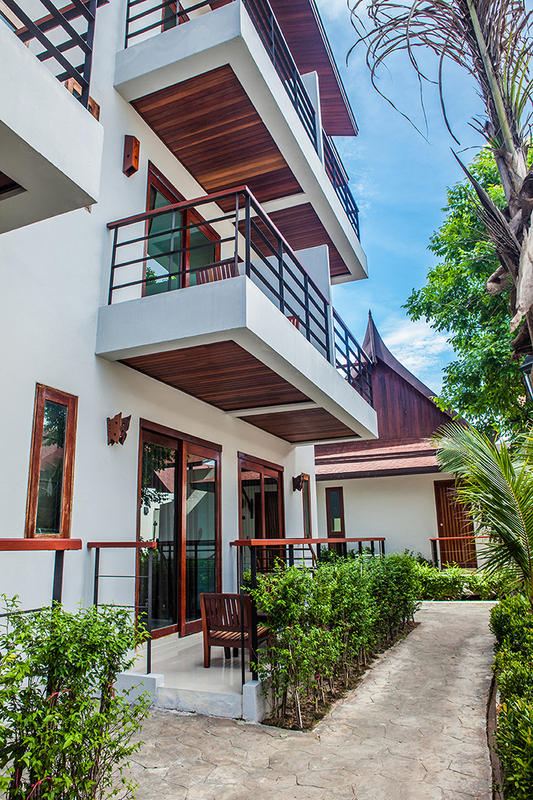 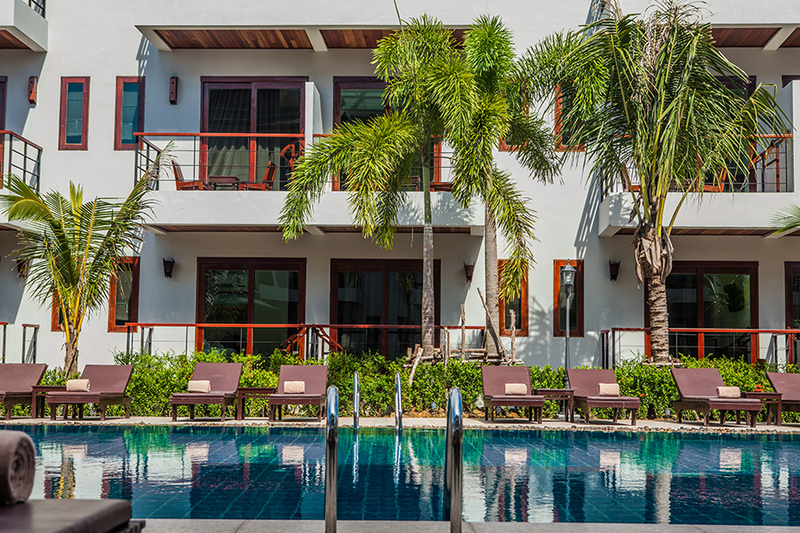 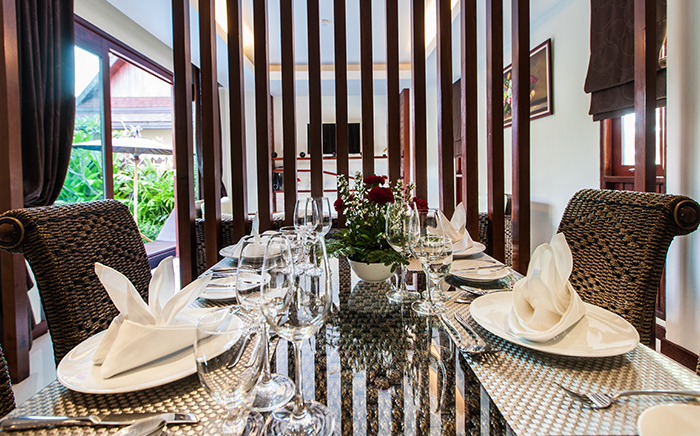 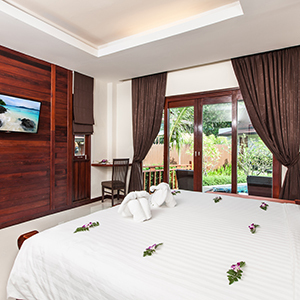 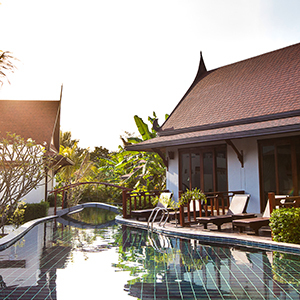 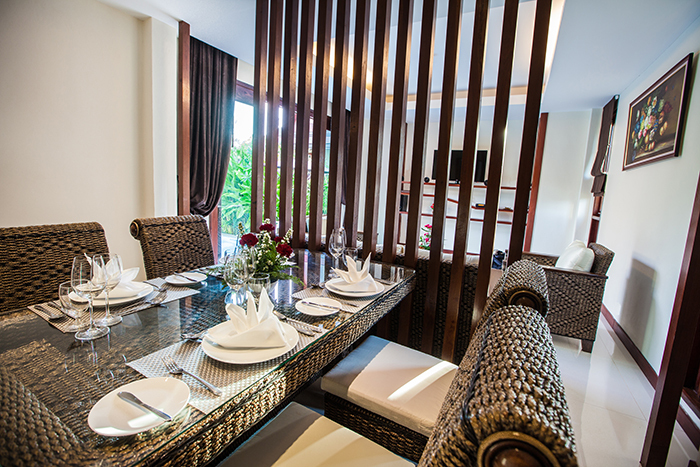 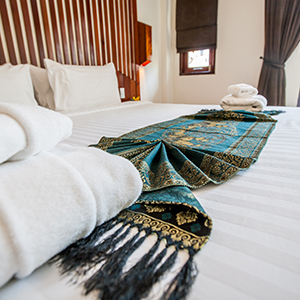 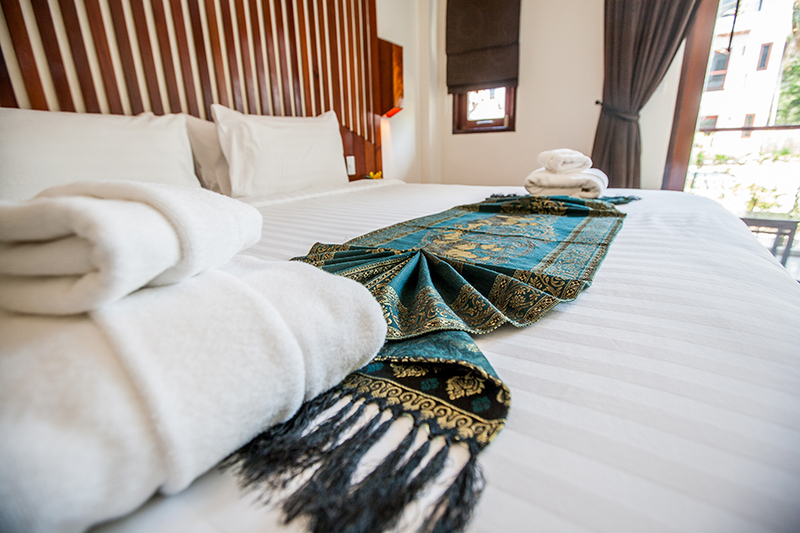 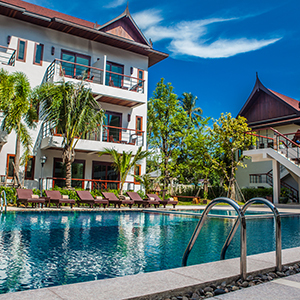 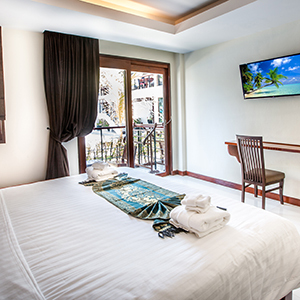 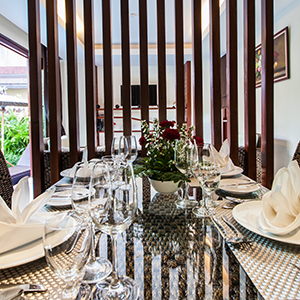 "Deluxe Pool View" has 3 floors and 36 rooms which are decorated with the contemporary Thai Fashion and each room has living space over 39.06 square meters and including balcony to enjoy. 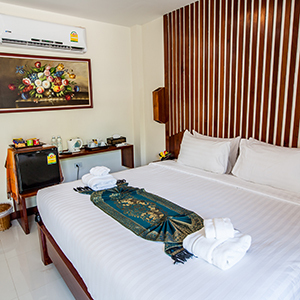 Room Size (sq.m.) 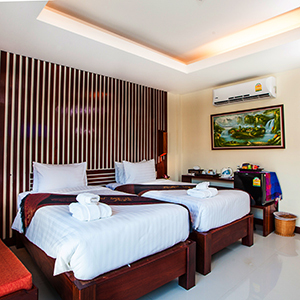 : 39.06 sq.m. 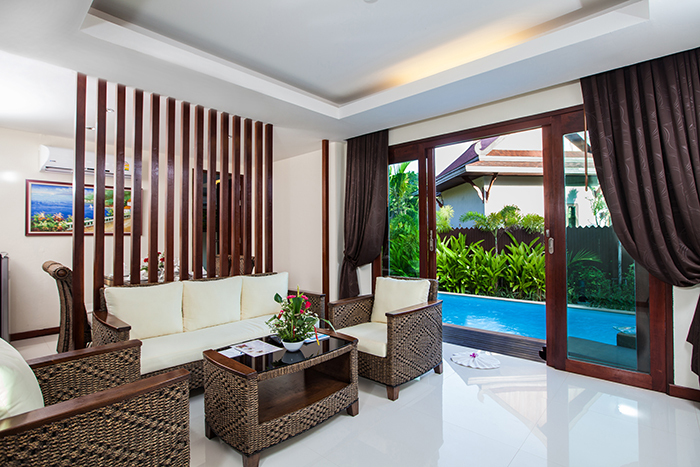 “Pool Access Villa with airport transfer”. 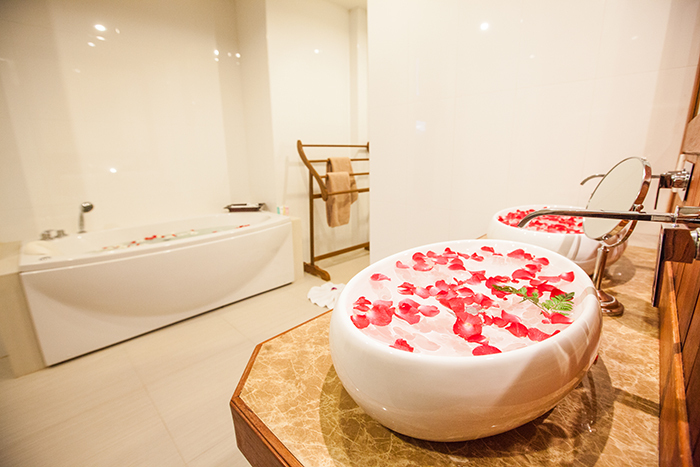 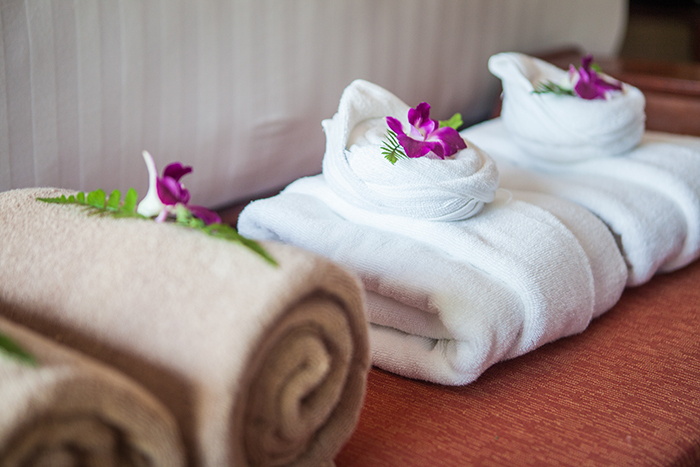 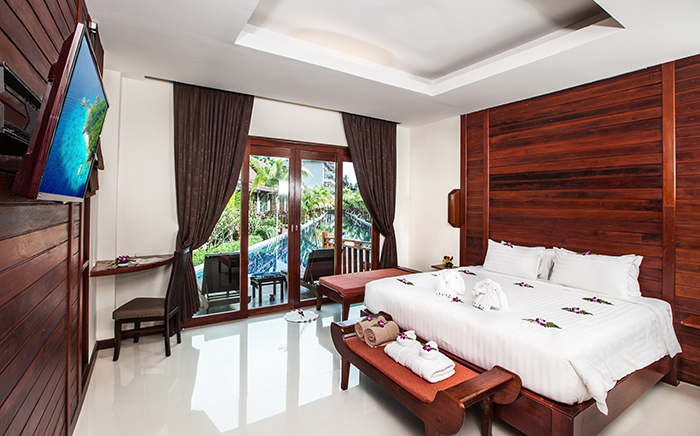 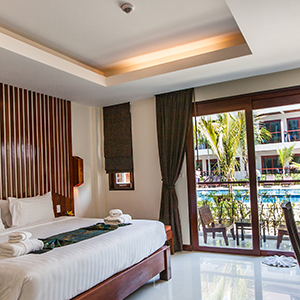 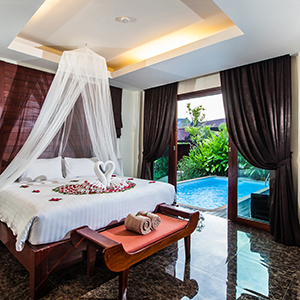 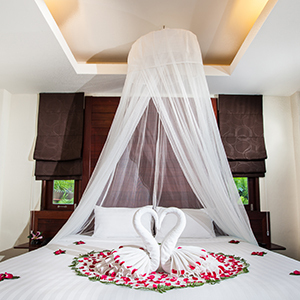 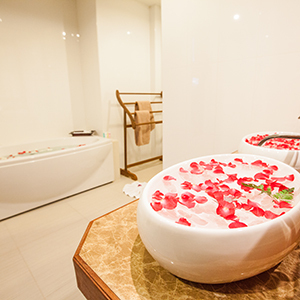 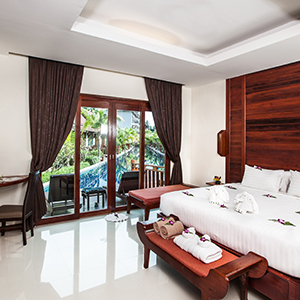 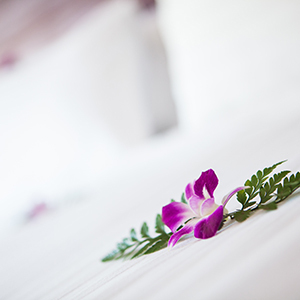 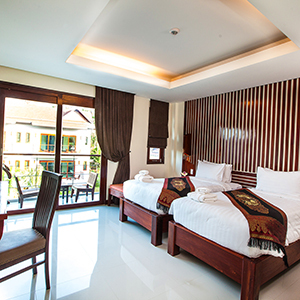 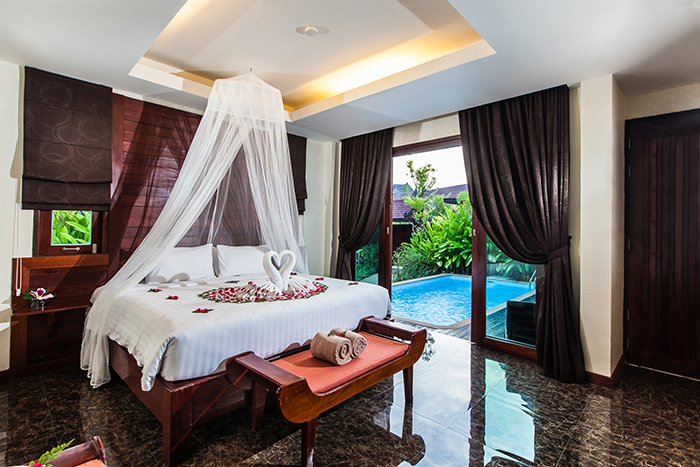 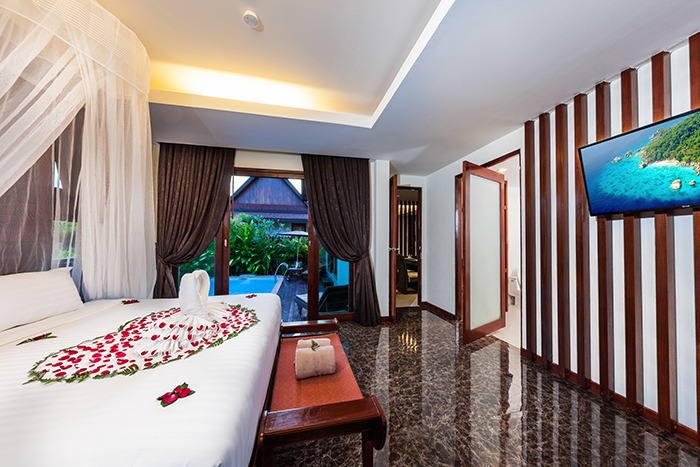 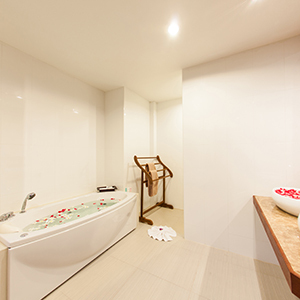 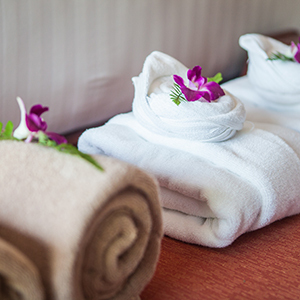 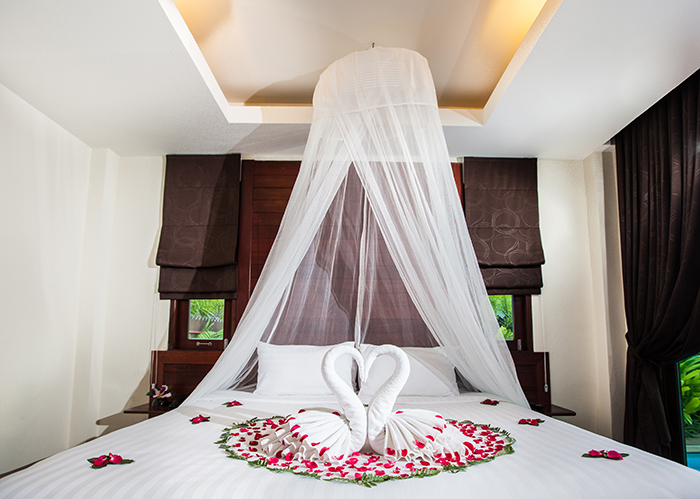 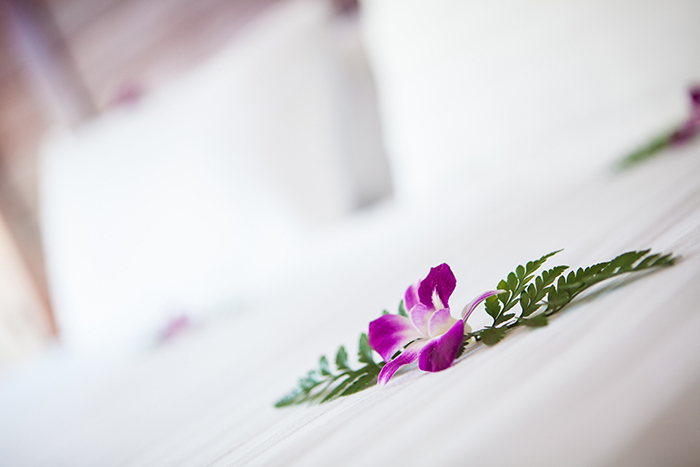 Rooms are suitable for a couple or honeymooner couple. 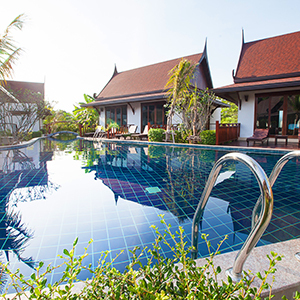 Take a refreshing dip in the resort pool from the comfort of your accommodation when staying at one of the 36 pool access rooms. 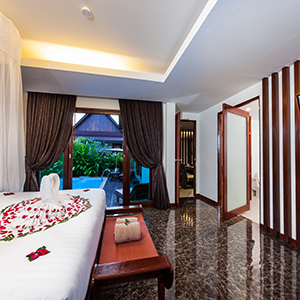 The 55.55 square meters room features a spacious private terrace that leads directly to the U shape swimming pool. 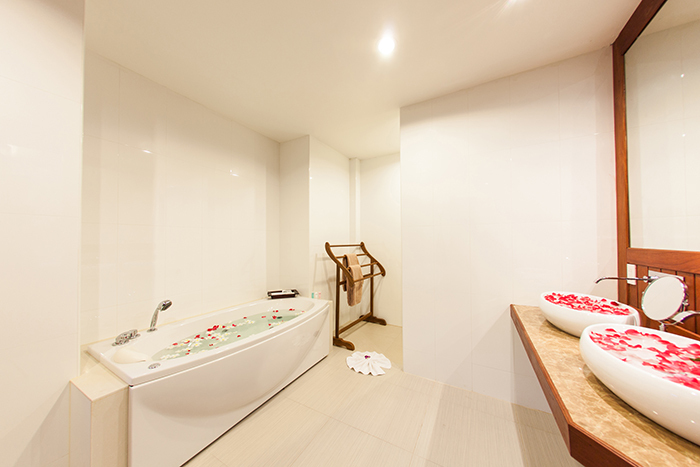 (Note: Not advisable for families with children under 12 yrs. 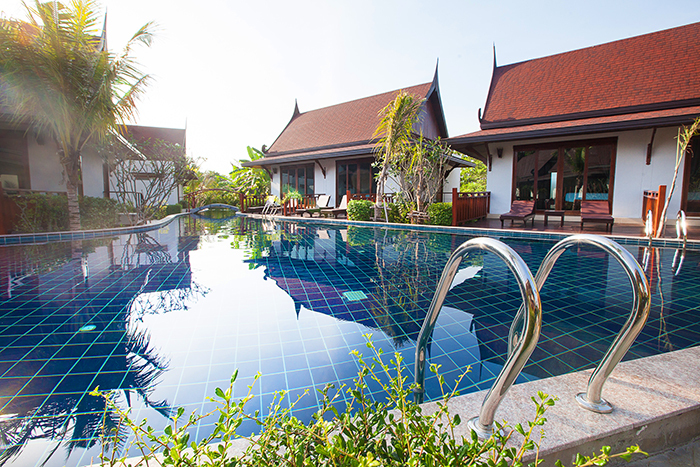 old because children can simple reach the pool if not supervised at all times). 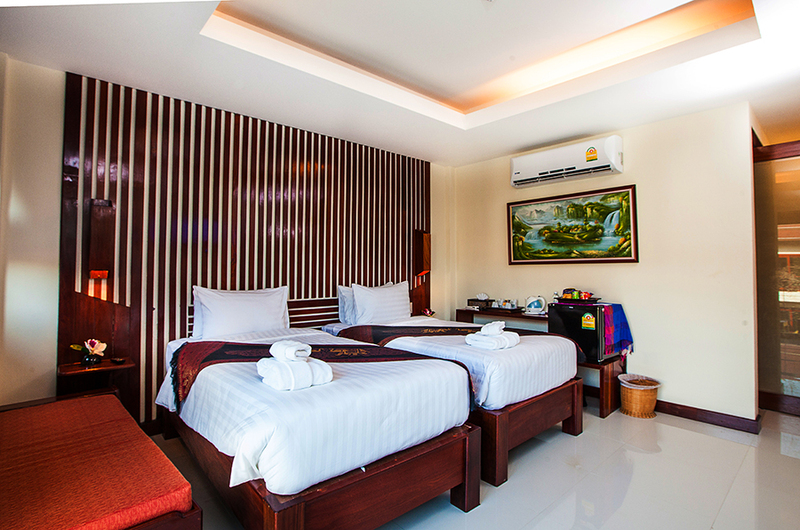 Room Size (sq.m.) 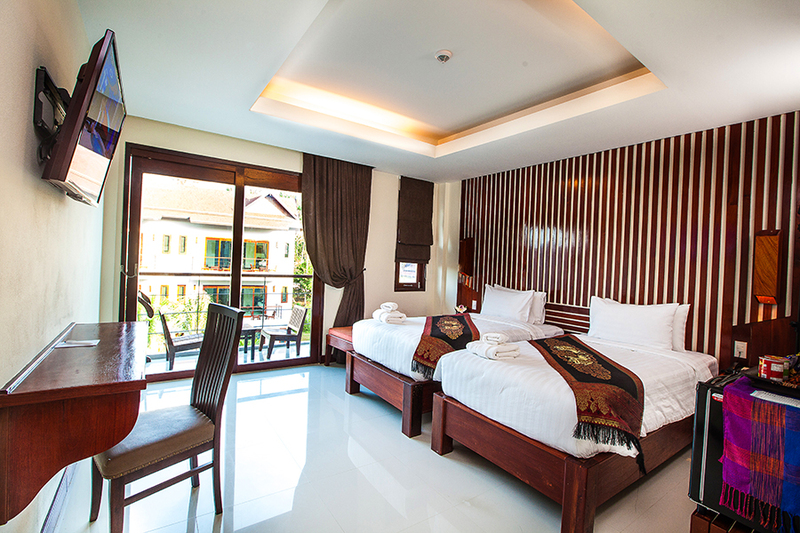 : 55.55 sq.m. 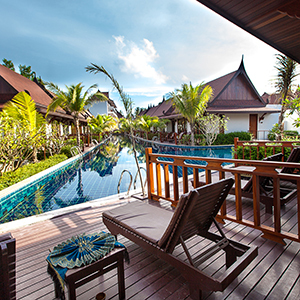 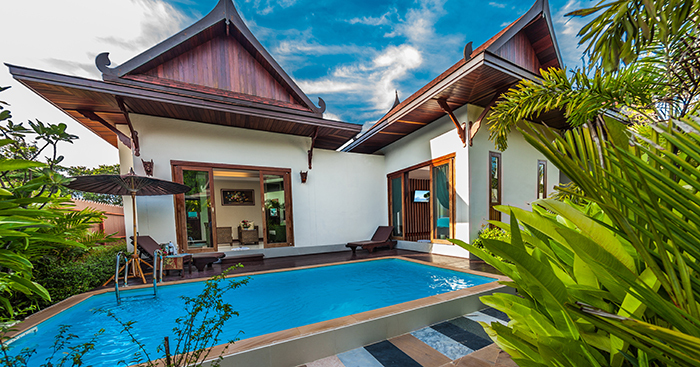 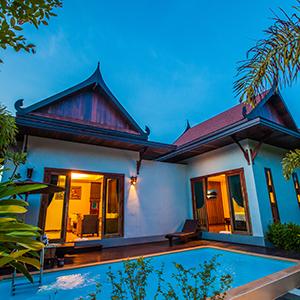 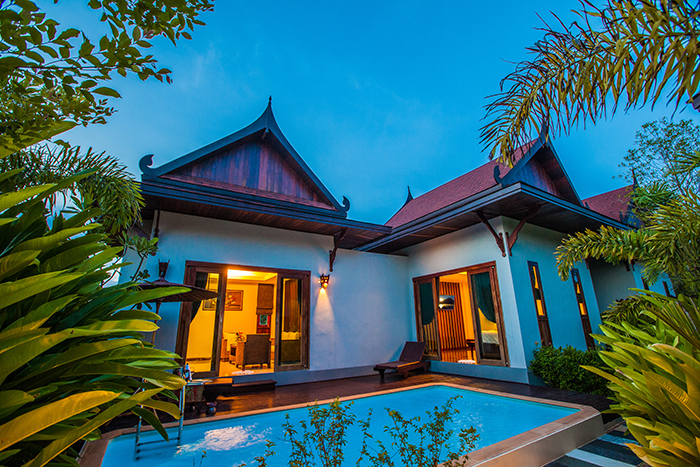 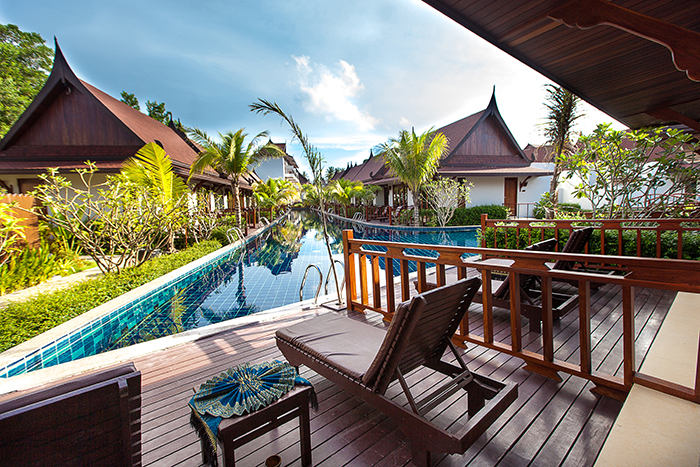 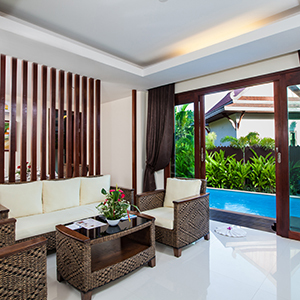 “Private Pool Villa with airport transfer”. 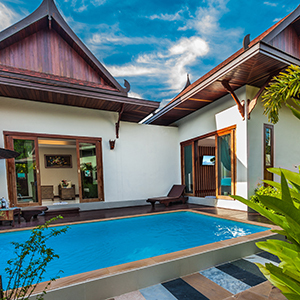 Villa with a private pool liner and a Jacuzzi for anyone who looks for a peaceful and beautiful place for vacation and long holidays. 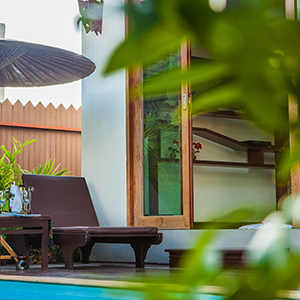 Our three Villas with a Private Pool are surrounded by a privacy area, each of them offers 140.50 square meters, feature floor-to-ceiling windows that overlook a private swimming pool, garden and sun loungers. 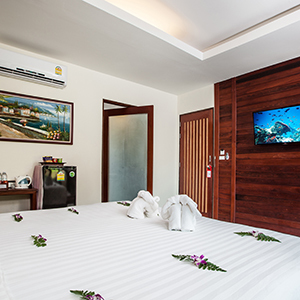 The room scenery is divided to 3 necessary parts which are seamlessly connected to the bedroom, bathroom and living room. 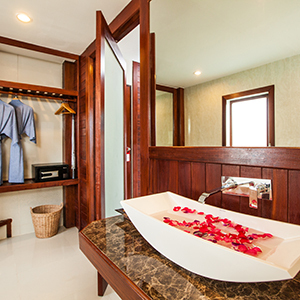 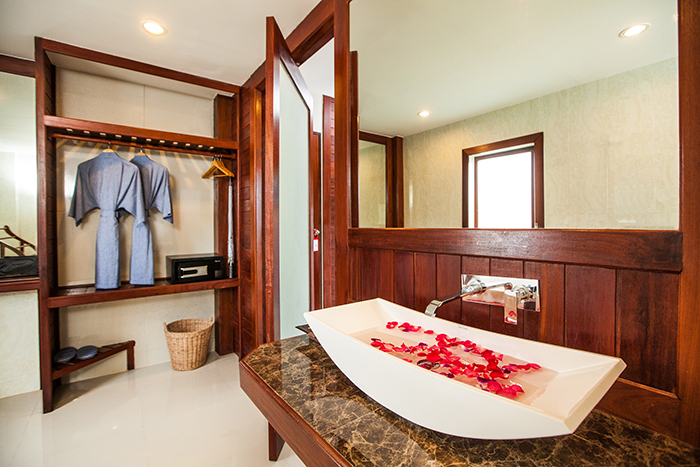 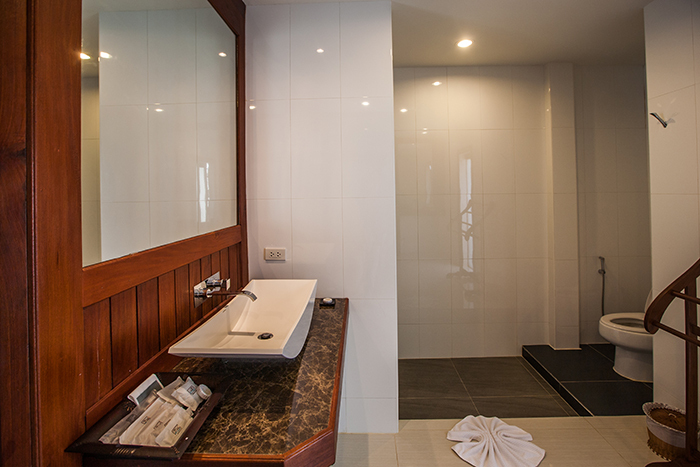 The interior features a king-sized bed and a spacious bathroom with twin basins, Jacuzzi, rain shower and soothing “his & her” amenities. 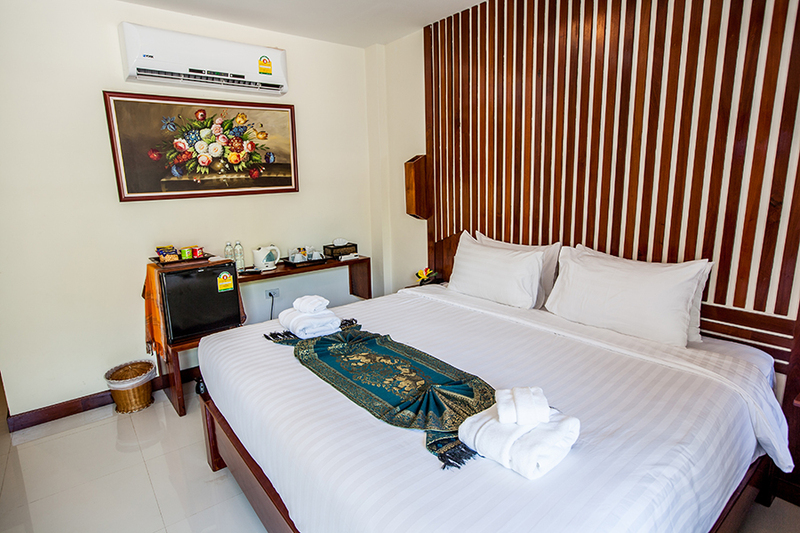 Room Size (sq.m.) 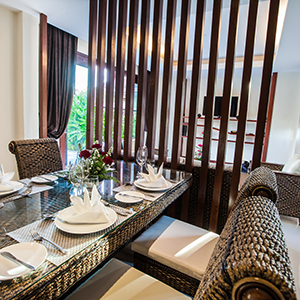 : 140.50 sq.m.